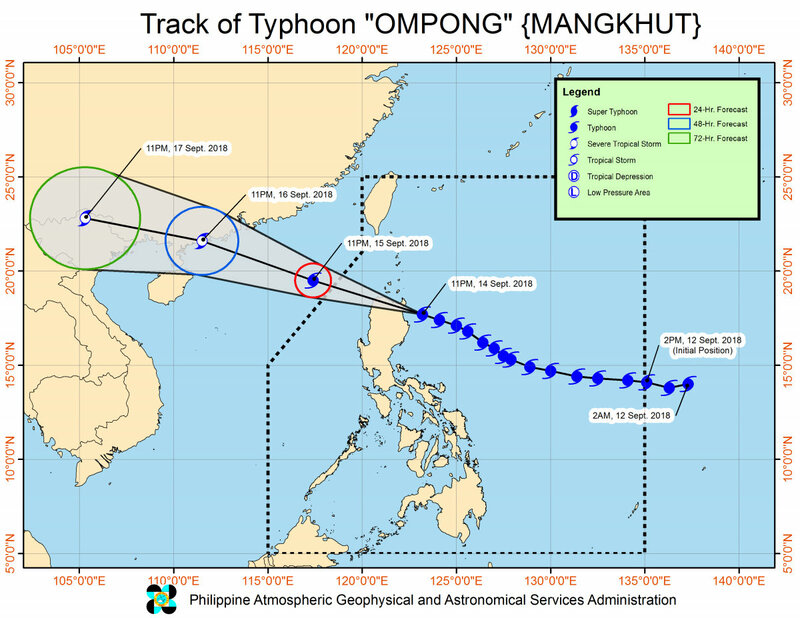 Super Typhoon Mangkhut, an extremely dangerous Category 5 cyclone in the Pacific known as Super Typhoon Ompong in the Philippines, made landfall in the Philippines on Sept. 15. Philippine weather agency PAGASA reported that the storm hit Baggao, Cagayan. Thousands of people had evacuated the area before the storm’s landfall. CNN reported the storm has 180 mph wind speeds (285 kph). A Category 5 hurricane on the Saffir-Simpson Hurricane Wind Scale is 157 mph or greater. The New York Times also reported that the storm is 550 miles in diameter. PAGASA said the storm surge could be as high as 20 feet (6 meters) in Cagayan and 7 feet (2 meters) in Isabela. “We are bracing for the worst here,” said Lanelyn Carrillo, a spokeswoman for World Vision, a humanitarian organization, CNN reported. “There is a sense of fear that we might be facing a storm as bad as Haiyan or Haima.” In 2013, Typhoon Haiyan, known as Yolanda in the Philippines, killed 6,000 people. The Philippine News Agency reported that strong winds and rains hit Laoag City, the capital of the Philippines’ province of Ilocos Norte, on the evening of Sept. 14, and more than 2,000 people living in low-lying areas in Ilocos Norte had evacuated. “Some of those who refused to evacuate in Pasuquin town are now being dealt with by the police,” Governor Ma. Imelda Josefa “Imee” Marcos told the news agency. Government forecaster Rene Paciente warned that the storm “can lift cars. You can’t stand, you can’t even crawl against that wind,” reported Al Jazeera. The Hong Kong Observatory said the typhoon posed “considerable threat” to its residents, Al Jazeera reported. Before it hit the Philippines, Mangkhut slammed the American island territory of Guam on Sept. 13, knocking out 80 percent of the electricity, the Times reported.